Anchors have been made and lost for as long as humanity has taken to the sea, and the Queen Anne’s Revenge is no different. La Concorde lost an anchor at the beginning of the voyage that would lead to it becoming the QAR, and had to return to port to locate a new one. The wreck site itself has produced three large fluked anchors in the immediate area, a large grapnel anchor, and a fourth anchor located some distance off site, presumably abandoned after an attempt to pull the vessel off the sandbar. Although anchors seem to be basic pieces of iron, there are several details archaeologists can learn from them when you take in to consideration their size, shape, and even their location on the wreck. Anchors were commonly wrought using hot forging, where the shank, arms, and flukes were produced separately using stacks of iron bars beaten into a single mass, then forge welded together to form the final shape. The size of an anchor can dictate what its main purpose may have been, as well as what size ship may have carried it. Some anchors may even have traces of maker’s marks, dates, or weight numbers remaining beneath their concreted surface. All three anchors directly on site were likely “bower” anchors for primary day to day use. Two of the anchors, A1 and A2, appear to have been in storage in the hold of the QAR during the wrecking event, as they were in the central area of the main ballast pile stacked together without stocks. A2 could also have been used as a “sheet” anchor, deployed during storms or times of greater need. The third anchor, A3, was located directly off the starboard bow where the “sheet” anchor was typically hung ready for deployment, and fell to rest near to its original location as the vessel slowly degraded through the passage of time. 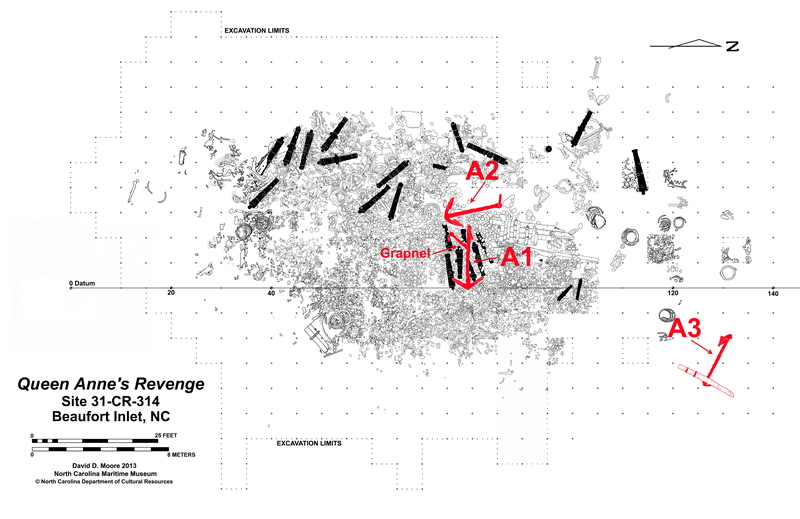 The size and location of A3 indicates that it was in use at the time of wrecking. A3 is unique in that it still carries its wooden stock after 300 years, a testament to the hearty black olive wood from which it was made. Only anchor A1 has been raised from QAR thus far. Weighing in at 1,965 pounds with an overall length of 11 feet, 7 inches, A1 is the smallest of the anchors found on site aside from the grapnel anchor. A1 also exhibits traits that are characteristically French for the period, with curved arms and flukes, as opposed to the straight arms of English admiralty anchors. Future studies of these artifacts will hopefully shed more light on the history of this iconic shipwreck. -Ciarlo, N. C., H. De Rosa, D. Elkin, H. Svoboda, C. Vázquez, D. Vainstub, and L. Diaz Perdiguero. “Examination of an 18th century English anchor from Puerto Deseado (Santa Cruz Province, Argentina),” Historical Metallurgy 45, vol. 1 (2011): 17-25. -Curryer, Betty Nelson. Anchors: An Illustrated History. Annapolis, MD: Naval Institute Press, 1999. -Jobling, Harold James Williamson. “History and Development of English Anchors CA. 1550 to 1850.” Master’s thesis, Department of Anthropology, Texas A&M University, 1993. 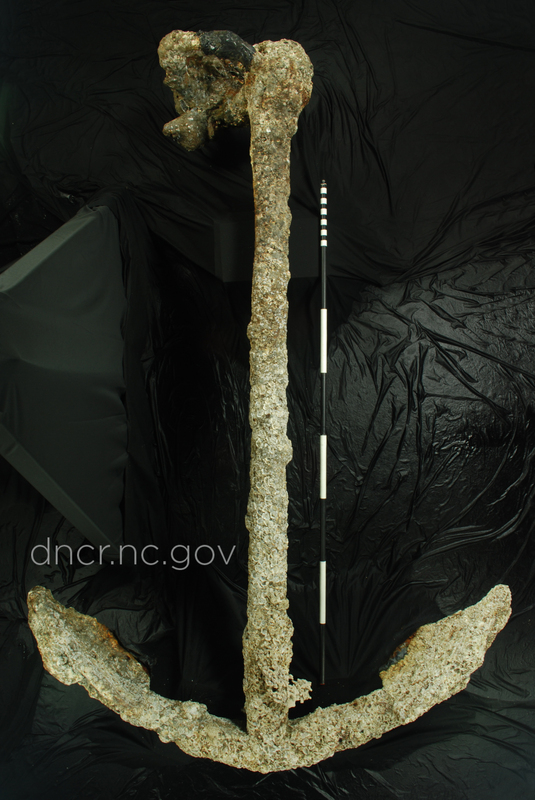 -Anchor from Queen Anne's Revenge shipwreck, courtesy NC Department of Natural and Cultural Resources. -Map of Queen Anne's Revenge site, courtesy NC Department of Natural and Cultural Resources.